Kia has expanded its range of alternative-powertrain models in the UK to four with the arrival of a plug-in hybrid (PHEV) version of the stylish and spacious Optima Sportswagon. It joins the Optima saloon PHEV, all-electric Soul EV and Niro dedicated hybrid crossover in helping to drive Kia towards its goal of a 25 per cent reduction in fleet average CO2 emissions by 2020, based on 2014 figures. With a range of up to 38 miles in all-electric mode, the Optima Sportswagon PHEV is able to complete many regular urban commuter runs with no tailpipe emissions, while its CO2 figure of just 33g/km means company car users pay just 13 per cent benefit-in-kind taxation in 2018-19. The Optima Sportswagon PHEV combines a 154bhp 2.0-litre direct-injection petrol engine with a 50kW (67bhp) electric motor powered by an 11.26kWh lithium-ion polymer battery pack. The electric motor replaces the torque converter in the smooth-shifting six-speed automatic transmission. When working together, the combustion engine and electric motor generate 202bhp and 375Nm of torque. A package of aerodynamic, styling and technology features contributes towards the Optima Sportswagon PHEV's low CO2 emissions and potential fuel economy of up to 201.8mpg. These changes ensure the PHEV is instantly recognisable as the high-efficiency model in the Optima Sportswagon range while minimising any impact on its practicality. The most significant aerodynamic change is an active air flap grille which lowers the car's drag co-efficient (Cd) to 0.28 when closed. The neat integration of the batteries in the boot floor, along with a 15-litre reduction in the size of the fuel tank compared with the diesel-engined Optima Sportswagon, means the PHEV is able to offer a generous 440 litres of luggage capacity with all seats upright, rising to 1,574 litres when the rear seats are lowered, while the payload is 390kg. Naturally, such a technologically advanced addition to the Optima family is available with a comprehensive range of connectivity and advanced driver assistance features, including an 8.0-inch touchscreen navigation system with European mapping. Android Auto™, Apple CarPlay™, Kia Connected Services powered by TomTom, a wireless mobile phone charger and an eight-speaker harman/kardon Premium Sound audio system linked to a digital radio are also standard. Hybrid sales in the UK and mainland Europe have doubled over the past five years and are expected to reach 700,000 a year by the end of the decade. The Optima Sportswagon PHEV, alongside its saloon counterpart, ensures Kia is perfectly positioned to take advantage of this growth. It is offered in the UK as an extensively equipped stand-alone model in the Optima Sportswagon line-up. 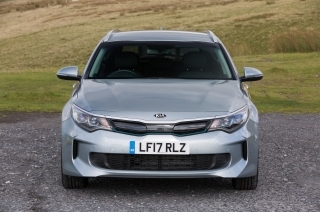 Hybrids are not new to Kia and indeed the Optima range, but until 2016 they had never previously been brought to the UK because diesels offered greater tax advantages in the all-important company car market. The Optima PHEV saloon and PHEV Sportswagon, with their extensive all-electric driving range, low CO2 emissions and ultra-low company car tax rating, change this and are important additions to Kia's fleet line-up in the UK. The core feature of the hybrid system is the next-generation 11.26kWh lithium-ion polymer battery pack, which produces significantly more energy than that in previous Optima hybrids. Meanwhile, the simplicity of the hybrid system allows compact packaging of the petrol engine, electric motor and automatic transmission on the front axle, with minimal energy transfer and conversion losses. This results in excellent performance and range for a D-segment estate car: up to 38 miles of pure-electric driving at speeds as high as 75mph, a hybrid range of up to 695 miles and 0-60mph acceleration in 9.4 seconds in hybrid mode. The switch between electric and hybrid driving is seamless, while the electric motor's 205Nm of torque from standstill ensures rapid acceleration and instantaneous response to the throttle pedal. The Optima Sportswagon PHEV is equipped with a number of technological innovations to help it use the power in its battery pack in the most efficient way and top up its batteries on the move. The car's sophisticated technologies include regenerative braking, a driving style guide, an ECO-DAS (ECOnomy Driver Assistance System) featuring a Drive Mode Select button so that drivers can personalise the powertrain's dynamics, and an HEV (Hybrid Electric Vehicle) Select switch. It also has an intelligent heating, ventilation and air conditioning (HVAC) system to save battery power. HEV Select gives access to two driving modes via a button in the centre console. In EV (charge depletion) mode the car runs as a purely electric vehicle when the energy stored in the batteries is adequate, and is able to regenerate electrical power on the move to recharge the batteries. The Optima Sportswagon PHEV has an all-electric driving range of up to 38 miles. HEV (sustaining) mode allows the powertrain to balance the use of motor and petrol engine for a seamless combination of electric and internal combustion power. In this mode, a greater proportion of propulsion comes from the petrol engine and the charge level of the batteries is constantly being topped up for later use. The Drive Mode Select gives the driver the choice of Eco and Normal settings to obtain maximum energy efficiency or greater performance. This switch is also located in the centre console. A driving style guide delivers information through the instrument panel about how efficiently the car is being driven so that drivers can adapt their driving style as necessary. Kia's regenerative braking system, now in third generation guise, allows the car to harvest kinetic energy – energy created by motion – to top up the batteries when coasting or braking. The advanced HVAC system has been adapted from that in the Soul EV, and permits only the driver's side of the car to be cooled when the other seats are unoccupied to minimise energy usage. It does this through a smart air intake, in contrast to rival systems which merely divert the airflow towards the driver when other vents are closed and consequently do not reduce overall energy consumption. A package of aerodynamic and styling changes distinguishes the Optima Sportswagon PHEV from its diesel-engined counterparts. Together, these make the PHEV more efficient at cutting through the air, thus saving precious energy, while ensuring that it is instantly recognisable as the most efficient car in the range. Chief among the aerodynamic improvements is an active air flap grille which automatically closes when engine cooling requirements are at their lowest, so that air passes more efficiently over and around the car. When activated, it lowers the drag coefficient (Cd) of the PHEV to 0.28, rather than the 0.29 of the diesel Optima Sportswagon. Every small improvement in drag can have a significant effect on fuel consumption, especially at higher speeds. There are also uniquely profiled front and rear bumpers for the PHEV to reduce air turbulence. Distinguishing features of the PHEV are chrome enhancements with a metallic blue finish on the lower front air grille, the 'tiger-nose' main grille and the side sills. There are 'ECO plug-in' badges on the front wings, while the recharging port for the batteries is housed in the left front wing. Inside the PHEV, the standard 8.0-inch touchscreen features additional menus to help the driver achieve the maximum all-electric driving range. It provides valuable information on the status of the batteries, the location of nearby charging stations, energy use based on driving style and the mileage which can be expected from the energy remaining in the batteries. To compensate for the additional weight imposed by the battery pack, the all-independent suspension of the Optima Sportswagon PHEV has been specially tuned, while the brakes have been enlarged compared with those on the diesel-engined version. The subframe-mounted suspension – featuring MacPherson struts at the front and a multi-link arrangement at the rear, with coil springs and gas-filled shock absorbers all round – remains unchanged, but the springs, dampers and alignment have been retuned. The result is agile handling with a cosseting ride. For packaging reasons the Optima Sportswagon PHEV features Kia's column-mounted Motor Driven Power Steering (C-MDPS) rather than the rack-mounted (R-MDPS) system fitted to diesel versions. To ensure braking performance is at least on par with that of the diesel Sportswagon, the rear brake discs of the plug-in hybrid have been enlarged from 262mm to 300mm. The Optima Sportswagon PHEV is available with a comprehensive suite of connectivity features, including Android Auto™ and Apple CarPlay™. At the heart of it is the latest Kia audio-visual navigation (AVN) system, operated via an 8.0-inch touchscreen and featuring Bluetooth hands-free mobile phone connectivity with audio streaming. The navigation screen is linked to a rear parking camera. Exclusive to the PHEV is a series of menus which show the car's EV range at any time, nearby charging stations and energy usage based on driving style, as well as other information to help the driver use the electrical energy stored in the batteries in the most efficient way. The AVN system is linked to a DAB digital radio as part of a 490-watt harman/kardon eight-speaker Premium Sound system, which includes an external amplifier and sub-woofer plus Clari-Fi technology, which restores the sound usually lost when digital music files are heavily compressed. There are USB sockets in the front and rear, and a wireless smartphone charger is standard. The Sportswagon PHEV is fitted with the full Kia Connected Services package powered by TomTom. This provides live traffic updates, speed camera alerts and local point-of-interest and weather reports. It is provided free for seven years. Additionally, the PHEV is available with Android Auto™ for use with Android phones running 5.0 (Lollipop) or higher, and Apple CarPlay™, which is compatible with iPhone 5 or newer. Android Auto™ connects the car to the user's smartphone and, via pre-downloaded apps, gives access to Google Maps navigation, Google Play music, hands-free calls and texts and voice recognition. Apple CarPlay™ enables full Siri voice control of the phone's apps and functions while linking the car to Apple Maps, calls and text dictation, music streaming and audiobooks. The PHEV is built around the same, highly protective crash structure as diesel versions of the Optima saloon and Sportswagon, which earned a five-star rating in Euro NCAP impact tests. It provides exemplary passive and active safety thanks to its occupant restraint systems and advanced active driver assistance features. More than half of the body (51 per cent) is made of advanced high-strength steels, particularly to reinforce the A- and B-pillars, side sills, floor and front wheel arches. Six airbags are fitted as standard. Electronic Stability Control and Vehicle Stability Management are standard. These automatically counter any loss of traction when cornering or setting off on surfaces with differing levels of grip from left to right. Hill-start Assist Control, which holds the car when setting off on inclines, is also standard. The PHEV is an extensively equipped stand-alone model in the Optima Sportswagon range. Its comprehensive specification includes 17-inch alloy wheels shod with 215/55 R17 tyres, LED daytime running lights and headlights – the latter with automatic levelling, welcome and follow-me-home lighting, black cloth and faux leather seats with eight-way power adjustment and four-way power lumbar adjustment on the driver's side, an 8.0-inch touchscreen satellite navigation system with European mapping, the eight-speaker harman/kardon Premium Sound system with Clari-Fi digital sound restoration technology, front and rear parking sensors, a reversing camera integrated into the navigation screen, dual-zone automatic air conditioning, a leather-trimmed steering wheel and gearshifter, steering wheel mounted controls, all-round electric windows, cruise control with a speed limiter, remote central locking, an electronic parking brake, a wireless phone charger and a 4.3-inch full-colour TFT (Thin Film Transistor) instrument cluster. Uniquely in the Sportswagon range, it has bespoke low-drag front and rear bumpers, an active air-flap grille, a blue tint to the headlights, blue chrome trim on the lower front air intake, upper grille and side sills and an exclusive navigation screen with a series of menus to help the driver achieve the highest possible range in EV mode. In keeping with every Kia, the Optima Sportswagon PHEV comes with the company’s unique-in-the-UK seven-year or 100,000-mile warranty, subject to certain wear and tear conditions. The warranty is fully transferable should the car be sold before the time or mileage limits have been reached. 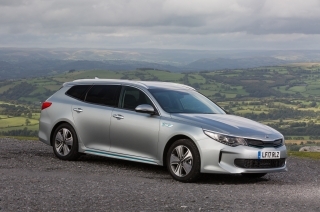 The Optima Sportswagon PHEV is available with ‘Kia Care’ service plans, which have been developed to provide customers with a wide range of service plan options for any Kia model within the first seven years of the vehicle’s life – matching its industry-leading seven-year warranty. A package of aerodynamic and styling changes distinguishes the Sportswagon PHEV from other models in the Optima Sportswagon range. Together, these make the Sportswagon PHEV more efficient at cutting through the air, thus saving precious energy, while ensuring that it is instantly recognisable as the most efficient car in the line-up. Chief among the aerodynamic improvements is an active air-flap grille which automatically closes when engine cooling requirements are at their lowest, so that air passes more efficiently over and around the car. When activated, it lowers the drag coefficient (Cd) of the PHEV to 0.28, rather than the 0.29 of other versions of the Optima Sportswagon. Every small improvement in drag can have a significant effect on fuel consumption, especially at higher speeds. There are also uniquely profiled front and rear bumpers for the PHEV to reduce air turbulence. Distinguishing features of the PHEV are chrome enhancements with a metallic blue finish on the lower front air grille, the 'tiger-nose' main grille and the side sills. There are also 'ECO plug-in' badges on the front wings, while the recharging port for the batteries is housed in the left front wing. Otherwise the Sportswagon PHEV retains the stylish lines and profile of the diesel-engined Sportswagon. The Sportswagon is based on the Kia SPORTSPACE concept which was unveiled at the 2015 Geneva Motor Show, and fulfils the promise of the concept car. The Optima Sportswagon is the SPORTSPACE in showroom clothing, with changes kept to a minimum and only made where they were needed to improve practicality, keep production and ownership costs down or satisfy legislation. Kia has not deliberately set out to create the most voluminous car in its class, although a boot capacity of 440 litres, rising to 1,574 litres with all three rear seats folded, makes the Sportswagon thoroughly practical. The 40:20:40 split of the rear seats and one-touch folding mechanism mean it is equally versatile. There is also a 12-volt power socket in the boot and a luggage area light, load cover and retaining hooks. The payload, meanwhile, is 390kg – a generous allowance compared with many hybrid models, which have to sacrifice some of their maximum load capacity because of the weight of their batteries. 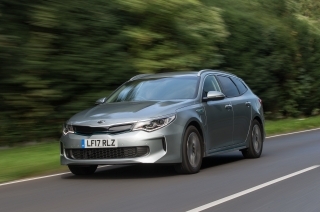 The Optima Sportswagon is one of, if not the, most stylish D-segment estates, maintaining Kia's reputation for producing cars that are immensely desirable and beautifully crafted without losing sight of the fact that people need to use and live with them. It is this combination of style, class and usability which sets the Optima Sportswagon and the PHEV version apart from their contemporaries. The Sportswagon PHEV features the same sharp lines, smooth bodywork and crafted surfaces as the saloon on which it is based, and the front half of both cars from the bonnet to the B-pillar is identical. Most of their dimensions are the same, too – an overall length of 4,855mm, wheelbase of 2,805mm and width of 1,860mm. The only minor difference is in height, which grows by 5mm to 1,470mm in the Sportswagon because of the stylish, integrated roof rails. The rear half of the Sportswagon PHEV is characterised by a strong, rising shoulder line and a gently sloping roofline which give the cabin its swept-back appearance and distinctive tourer body shape. The rear overhang of 1,085mm adds visual volume, but in an elegant way thanks to the raked rear window and tapering roofline. As a result, the Sportswagon PHEV has a genuinely athletic stance in a market segment noted for conservatism. Wide LED combination tail lamps wrap around the rear corners. The European estate market is dominated by so-called premium brands, so it was vital that for its first foray into this sector, Kia should come up with a design that would stand out and give the car a visual identity to match its quality and technology. Not surprisingly, as the Sportswagon is sold only in Europe, the responsibility fell to the company's European Design Centre in Frankfurt, led by Chief Designer Gregory Guillaume. "The first challenge was to look at the mass of the car behind the C-pillar – an area most competitors signify with as long a final window as possible to delineate the load space. We felt we could do something different and so we applied a much larger D-pillar. This gives the car differing and individual proportions – we believe it endows the Sportswagon with a sportier, almost elongated-hatchback look. The Optima Sportswagon PHEV shares the admired styling of the saloon in most other respects, with clear character lines above the side sills and the distinctive treatment above and below the front bumper – incorporating the Kia 'tiger-nose' grille. 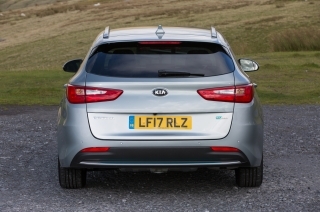 At the rear, the fifth door is clean and functional, but makes a strong contribution to the car’s overall appearance by emphasising its width and endowing it with a ‘planted’ appearance – a feature now part of Kia’s on-road distinctiveness. The load opening is wide, with a low sill and a floor flush with the opening. There is a wide tailgate and low lip, with a lift-over height specifically designed to make it easy to load heavy items. Stylish, integrated roof rails are standard, allowing 100kg of luggage to be transported outside the car. The 40:20:40 split folding rear seats allow two people to travel in comfort while still leaving space for long loads. Alternatively, the seats can be folded in one of several combinations to create a maximum load space of 1,574 litres, making the Sportswagon PHEV highly competitive as a working wagon. When fitted with a tow bar, the PHEV can haul a 1,500kg braked trailer, or a 750kg unbraked trailer. This is the same as a diesel Sportswagon with automatic (7-DCT) transmission. The Sportswagon PHEV has the same modern, horizontally structured dash layout as the saloon, and the same high-quality fit and finish. The centre console is angled at 8.5 degrees towards the driver. The central 8.0-inch touchscreen is set at exactly the same height as the instruments in the main cluster to make it easier for the driver to absorb information quickly. The fascia is divided into upper display and lower control zones, and the number of buttons and switches has been kept to a minimum because as many functions as possible are accessed via the touchscreen, simplifying use and giving the cabin a less cluttered look. The display and control zones are separated by a horizontal chrome strip which enhances the increased width of the cabin. The interior is trimmed in black cloth with faux leather. Faux leather has been applied to the door and centre console armrests; black leather is standard on the gearlever and steering wheel; the door switch panels have a gloss black finish; the door handles and touchscreen bezel are in satin chrome and there are stainless steel scuff plates on the door sills. The centre console has an aluminium finish. The quality is also apparent in the soft-touch materials, interior lighting and, on the road, the levels of refinement as a result of the application of extensive sound-proofing. The A-list nature of the interior is reinforced by the levels of connectivity and technology on board. Every model has satellite navigation with European mapping accessed via an 8.0-inch touchscreen and linked to Kia Connected Services featuring TomTom traffic, which provides traffic and speed camera alerts, weather reports and local search information. Bluetooth with music streaming, reversing sensors and a reversing camera are also standard, along with a wireless mobile phone charger. The Sportswagon PHEV also has a Thin Film Transistor (TFT) 4.3-inch colour instrument cluster. The sensation of comfort and luxury is reinforced by the amount of space for up to five occupants. The extensive headroom of the saloon is improved by 15mm in the rear of the Sportswagon: in all other respects head, leg and shoulder room are identical. The seat frames are stiff and light, reducing the vibration felt by occupants. On the driver's side there is eight-way power adjustment and four-way power lumbar adjustment. The upper seat backs, under-thigh supports and headrests feature soft foam, while the side bolsters are deep and made of denser foam to provide greater lateral support. The Optima Sportswagon PHEV is driven by one of the most advanced powertrains ever to be offered for sale in a Kia. It features a 2.0-litre direct-injection (GDI) engine from the Nu family, assisted by an electric motor housed within the six-speed automatic gearbox. The electric motor effectively replaces the torque converter in the transmission. The sophisticated 360-volt power electronics system features an 11.26kWh lithium-ion polymer battery pack, advanced technologies to ensure the driver can obtain the maximum range in all-electric driving mode and recharge the batteries on the move, and an on-board charger which allows the batteries to be re-energised from fully depleted condition in just over three hours. Kia's Nu family of engines was introduced in 2011, replacing the previous Beta range, and is available in 1.8- and 2.0-litre guises in a number of models, although not in the UK. The Optima Sportswagon PHEV employs the 2.0-litre version which, with a cylinder bore of 81mm and a piston stroke of 97mm, has a displacement of 1,999cc. The 16-valve twin-cam cylinder head and engine block are made of aluminium, while the sump is fabricated from steel, and the engine features direct fuel injection (GDI) and dual continuously variable valve timing on the intake and exhaust sides. As tuned for the Optima PHEV, it develops 154bhp at 6,000rpm and 189Nm of torque at 5,000rpm. For the Optima Sportswagon PHEV, the engine has been modified with a high-energy coil, cooled exhaust gas recirculation, a variable pressure oil pump, revised piston ring coatings to minimise friction losses, an electric rather than a mechanical water pump and an oil warmer. Collectively, these improve efficiency by 6.5 per cent. The petrol engine is linked to a 50kW (67bhp) electric motor housed within the six-speed automatic gearbox. The permanent magnet synchronous motor takes the place of a torque converter. It develops its maximum power from 2,330 to 3,300rpm, and delivers 205Nm of torque from standstill to 2,330rpm, ensuring brisk acceleration when the car is being driven in all-electric mode at typical urban speeds. Together, the petrol engine and electric motor produce 202bhp at 6,000rpm and 375Nm of torque at 2,300rpm for instant, rapid response to throttle inputs. Acceleration from 0-60mph takes just 9.4 seconds in hybrid mode, and the top speed is 119mph. The hybrid powertrain provides a seamless blend of highly efficient performance and is compact and light, allowing it to be mounted on the front axle. The electric motor is supplied by a lithium-ion polymer battery pack with an electricity storage capacity of 11.26kWh. This allows the Optima Sportswagon PHEV to travel up to 38 miles at speeds as high as 75mph in all-electric mode – easily sufficient for the majority of urban commutes – and is a major contributor to the car's extremely low fuel consumption of 201.8mpg in the official NEDC combined cycle test, and CO2 emissions of only 33g/km. In hybrid mode the Optima Sportswagon PHEV has a range of up to 695 miles. The batteries are located behind the rear seat and in the spare wheel well, so a tyre repair kit is supplied as standard. This skillful packaging ensures that boot capacity losses are much less than in many hybrid cars: the Optima Sportswagon PHEV has 440 litres of luggage space with all seats upright, or 1,574 litres with the 40:20:40 rear seats down. The power electronics system is completed by a hybrid control unit, motor control unit and low AC-DC converter. The Optima Sportswagon PHEV is supplied with three-pin to Type 2 and Type 2 to Type 2 cables which ensure the batteries can be recharged from fully depleted in just over three hours through a 240-volt socket or charging post. The on-board plug-in point is located on the Optima's left-hand front wing. But the car also features sophisticated technologies to recharge the batteries on the move and help drivers to attain the maximum all-electric driving range. These include regenerative braking, a driving style guide, an ECO-DAS (ECOnomy Driver Assistance System) featuring a Drive Mode Select button so that drivers can personalise the powertrain's dynamics, and an HEV (Hybrid Electric Vehicle) Select switch. It also has an intelligent heating, ventilation and air conditioning (HVAC) system to save battery power. HEV Select gives access to two driving modes via a button in the centre console. In EV (charge depletion) mode the car runs as a purely electric vehicle when the energy stored in the batteries is adequate, and is able to regenerate electrical power on the move to recharge the batteries. The Optima Sportswagon PHEV has an all-electric driving range of up to 38 miles. HEV (charge sustaining) mode allows the powertrain to balance the use of motor and petrol engine for a seamless combination of electric and internal combustion power. In this mode, a greater proportion of propulsion comes from the petrol engine and the charge level of the batteries is constantly being topped up for later use. Kia's third-generation regenerative braking system in the Optima Sportswagon PHEV allows the car to harvest kinetic energy – energy created by motion – to top up the batteries when coasting or braking. The Optima Sportswagon PHEV has a six-speed automatic transmission rather than the continuously variable (CVT) system employed by most other hybrids. It incorporates the electric motor, which takes the place of a traditional torque converter. A Transmission-mounted Electric Device (TMED) ensures fast and seamless switching between electric and hybrid driving modes and precise control of the engine clutch. The transmission is particularly smooth in operation while being quieter and more refined than a CVT. Modifications to suit the application of the six-speed automatic in a plug-in hybrid include an electric rather than a mechanical oil pump and an oil pump control unit. The overall system efficiency of the transmission and electric motor is an exceptional 54.5 per cent. An enhanced engine clutch control system provides swift engagement of each gear and more consistent engagement times, while there are exclusive shift patterns for when the car is running in charge sustaining or charge depletion modes. The operation of the transmission also varies depending on whether Eco or Normal has been chosen through the Drive Mode Select switch. The Sportswagon PHEV relies on the same fully independent suspension as the diesel-engined Sportswagon, with subframe-mounted MacPherson struts with coil springs and twin-tube gas-filled dampers at the front and a subframe-mounted multi-link system with coil springs and twin-tube gas-filled dampers at the rear. There are front and rear anti-roll bars. For the Sportswagon PHEV, the springs, dampers and alignment have been retuned to take into account its greater weight and the packaging of the power electronics components. The front and rear subframe mounting points take advantage of the car's width, improving the smoothness of the ride, and there are four front bushing points to increase lateral stiffness, with extremely robust bearings. This results in improved steering responsiveness and greater cornering traction, with less delay when the car needs to settle after a severe road surface-induced jolt. It is an arrangement which provides ideal wheel alignment and body control even under high cornering loads, with good suspension travel and supple damping over a typically broken B-road surface. The car is extremely stable in crosswinds or when suddenly changing lanes on the motorway, ensuring it always remains under the driver’s complete control. For packaging reasons, the Sportswagon PHEV features Kia's column-mounted Motor Driven Power Steering (C-MDPS) rather than the rack-mounted (R-MDPS) system fitted to diesel versions of the Optima. To ensure braking performance is at least on a par with that of the diesel Sportswagon, the rear brake discs of the plug-in hybrid have been enlarged from 262mm to 300mm. There are 300mm ventilated front discs and solid rear discs. The anti-lock braking system incorporates Brake Assist to ensure maximum retardation in an emergency stop, regardless of the force applied to the pedal by the driver. Stability is further enhanced by Electronic Stability Control and Vehicle Stability Management, which counter-act skids or snaking when cornering or accelerating on roads with differing levels of grip from front to right. The PHEV also comes with Hill-start Assist Control (HAC), which maintains brake pressure for two seconds after the driver releases the pedal, to ensure smooth transitions on inclines. Comprehensive measures to counter NVH (noise, vibration and harshness) ensure that the PHEV has the refinement to match its upmarket appearance, quality and technology. The stiff bodyshell, made up of 51 per cent advanced high-strength steel, with extensive use of adhesives to bond body panels together, provides an ideal platform for this, while the low drag co-efficient of 0.28 plays a significant role in curtailing wind noise. Innovations include a large under-floor cover and highly effective windscreen seals, which contribute two per cent to the reduction in wind noise while improving aerodynamics and, consequently, fuel consumption. Comprehensive dashboard insulation lowers the amount of powertrain noise able to enter the cabin, while large cross-member bushings front and rear eliminate road noise and reduce the vibrations transmitted through the floor and steering wheel. The part played by the new body in improving NVH is also significant. With a rigid body frame and stiff body panels and engine mounts, there is a significant reduction in vibration throughout the cabin. Even the design of the alloy wheels helps to cut vibrations created by poor road surfaces. The Sportswagon PHEV benefits from the five-star safety rating awarded to the diesel-engined Optima range by Euro-NCAP. With its strong body made up of 51 per cent advanced high-strength steels, progressive deformation in an impact thanks to its front and rear crumple zones, side impact protection and extensive selection of driver assistance systems – including Electronic Stability Control and Vehicle Stability Management – the Optima Sportswagon PHEV helps to first prevent accidents and then, as a last resort, protect occupants if one is inevitable. 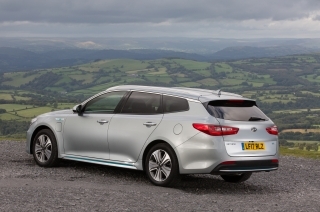 The Optima Sportswagon PHEV is one of the most technologically advanced cars Kia has ever launched in the UK. It is laden with advanced features to keep the driver and passengers connected with the outside world, to advance their comfort and convenience and to help drivers achieve the maximum all-electric driving range. Standard equipment includes a wireless charger for mobile devices, an eight-speaker harman/kardon Premium Sound system, Kia Connected Services with TomTom and an 8.0-inch touchscreen navigation system with European mapping linked to a reversing camera. Technologies to maximise its range on battery power include the ECO-DAS system, a Drive Mode Select button so that drivers can personalise the powertrain's dynamics, a plug-in hybrid HEV Select switch, regenerative braking and an intelligent heating, ventilation and air conditioning (HVAC) system. Business drivers can spend long days on the road, often in heavy traffic and foul weather, so anything which can make their lives more bearable is welcomed. The Optima Sportswagon PHEV is equipped to do just that. It has a 490-watt harman/kardon Premium Sound system with eight speakers, including a 4.0-inch central speaker, an 8.0-inch sub-woofer and an external amplifier. The system features Clari-Fi technology to restore the sound usually lost when digital music files are heavily compressed. Kia involved Harman engineers from the very first stages of the Sportswagon's development and design to ensure the audio system components could be integrated into the car without compromise. Hundreds of hours were then spent fine-tuning the system specifically for the car, taking into account its size, seating configuration and interior materials. The eight strategically mounted speakers have been optimised and tuned precisely for the Optima. The system also has an 11-channel, 490-watt digital amplifier with programmed Digital Signal Processing; QuantumLogic Surround, which identifies individual instruments and voices and presents them in a precise, multi-channel sound stage; and Automatic Speed Dependent Volume Control, which eliminates the need for the driver to readjust the audio system's volume while on the move by controlling individual channels according the car's speed. There is also a DAB digital radio, front and rear USB ports and an AUX socket in the dashboard. The system supports Bluetooth mobile phone connectivity and music streaming and is compatible with MP3 players. For added convenience, a wireless mobile phone charger – housed in the front of the centre console tray – is incorporated. It uses inductive charging to recharge the batteries of compatible electronic devices. Occupants are therefore able to charge mobile phones or MP3 players without the inconvenience of wires and connectors, which frequently change when new devices are introduced. The wireless charger features foreign object detection, switches on automatically when a phone is placed upon it and displays the phone's charge status in the instrument cluster. An in-built safety system prevents overheating, while drivers and passengers are warned if they are about to leave the car with the phone still on the charging pad. The car's audio-visual navigation (AVN) system is operated via an 8.0-inch touchscreen which also controls the satellite navigation system and Kia Connected Services. Exclusive in the PHEV is a series of menus which show the car's EV range at any time, nearby charging stations and energy usage based on driving style, as well as other information to help the driver use the electrical energy stored in the batteries in the most efficient way. The navigation system includes full European mapping, while Kia Connected Services with TomTom, when linked to a smartphone, provides live traffic updates refreshed once a minute, with suggested alternative routes to avoid congestion. It also displays weather forecasts; local searches under 500 categories , including Kia dealerships, petrol stations, restaurants and supermarkets; and alerts for such things as speed cameras and accident blackspots. It is provided free for seven years. Additionally, the car is available with Android Auto™ for use with Android phones running 5.0 (Lollipop) or higher, and Apple CarPlay™, which operates with iPhone 5 or newer. The Optima Sportswagon PHEV has an all-electric driving range of up to 38 miles. Sophisticated technologies recharge the batteries on the move and help drivers to attain the maximum driving range on battery power alone. These include regenerative braking, a driving style guide, an ECO-DAS system with a Drive Mode Select button so that drivers can personalise the powertrain's dynamics, and a plug-in hybrid HEV Select switch. HEV Select gives access to two driving modes via a button in the centre console. In EV mode the car runs as a purely electric vehicle when the charge level is adequate and is able to regenerate electrical power to recharge the batteries. HEV mode allows the powertrain to balance the use of motor and petrol engine for a seamless combination of electric and internal combustion power. In this mode, a greater proportion of propulsion comes from the petrol engine and the charge level of the batteries is constantly topped up for later use. Drive Mode Select gives the driver the choice of Eco and Normal settings to obtain maximum energy efficiency or greater performance. This switch is also located in the centre console. The driving style guide assists by delivering information via the instrument panel about how efficiently the car is being driven so that drivers can adapt their driving style as necessary. Every time the driver coasts or brakes, kinetic energy is captured and channelled to the batteries for use later. The Optima Sportswagon PHEV also has Kia’s advanced heating, ventilation and air conditioning (HVAC) system, first seen in the Soul EV. This uses an energy-scavenging heat pump to recycle waste heat from the air conditioning and electrical systems, a smart air intake system and a ‘Driver Only’ ventilation option so that cooled or warmed air goes only to the driver’s side of the car when other seats are unoccupied. This contrasts with other systems where closing some vents merely diverts air through the others while energy consumption remains the same. The HVAC system therefore reduces load on the battery and cuts energy consumption. The Sportswagon PHEV is an extensively equipped stand-alone model in the Optima Sportswagon range. Its comprehensive specification includes 17-inch alloy wheels shod with 215/55 R17 tyres, LED daytime running lights and headlights – the latter with automatic levelling, welcome and follow-me-home lighting, black cloth and faux leather seats with eight-way power adjustment and four-way power lumbar adjustment on the driver's side, an 8.0-inch touchscreen satellite navigation system with European mapping, the eight-speaker harman/kardon Premium Sound system with Clari-Fi digital sound restoration technology, front and rear parking sensors, a reversing camera integrated into the navigation screen, dual-zone automatic air conditioning, a leather-trimmed steering wheel and gearshifter, steering wheel mounted controls, all-round electric windows, cruise control with a speed limiter, remote central locking, an electronic parking brake, a wireless phone charger and a 4.3-inch full-colour TFT (Thin Film Transistor) instrument cluster. The comprehensive suite of connectivity features, including Android Auto™ and Apple CarPlay™. At the heart of it is the latest Kia audio-visual navigation (AVN) system, operated via an 8.0-inch touchscreen and featuring Bluetooth hands-free mobile phone connectivity with audio streaming. The navigation screen is linked to a rear parking camera. Exclusive to the PHEV is a series of menus which show the car's EV range at any time, nearby charging stations and energy usage based on driving style as well as other information to help the driver use the electrical energy stored in the batteries in the most efficient way. Uniquely in the Sportswagon range, it has bespoke low-drag front and rear bumpers, an active air-flap grille, blue chrome trim on the lower front air intake, upper grille and side sills and an exclusive navigation screen with a series of menus which help the driver to achieve the highest possible range in EV mode. Kia's ultimate goal is to decarbonise road transport completely, and the company is actively working on – and planning to market before the end of the decade – further vehicles which can help the company achieve that ambition, including a hydrogen fuel cell car. Kia is investing more than £6 billion and recruiting some 7,300 new research and development engineers with this aim in mind. But it will be some time before battery technology, fuel cell costs and infrastructures are capable of supporting a widespread switch to all-electric and fuel-cell cars. In the meantime hybrids, and especially plug-in hybrids, have the ability to significantly reduce tailpipe emissions without needing heavy investment in new infrastructures. The Optima Sportswagon PHEV slots into the D-segment of the UK market. It is a sector heavily reliant on fleet and business customers, whose principal concerns are whole-life running costs, leasing charges and – for the individual user – benefit-in-kind (BIK) taxation. Until now, diesel was the best way to meet those requirements. It is why Kia has never marketed a purely petrol-engined Optima in the UK. As with every Kia, repairability has been engineered in from the start of the design stage to keep insurance costs to a minimum, and the car is covered by a seven-year or 100,000-mile transferable warranty. Servicing is required every 10,000 miles or once a year, whichever comes soonest. Kia set a new benchmark in 2007 when it launched the cee'd with an industry-best seven-year warranty. That demonstration of faith in the quality and reliability of Kia products has subsequently been extended to cover every model, including PHEVs. All versions of the Optima for European markets, including PHEVs, are built at the Hwasung plant in Asan Bay, Korea. Hwasung is Kia's largest factory in the world, with a production capacity of 600,000 cars a year. It opened in 1989 and manufacturing began in 1991. Hwasung is also home to a 200-acre proving ground with 16 driving courses, opened in 1993, and it houses an employee sports centre, giving the 12,000 workers and their families access to gymnasiums, swimming pools, squash courts and weight-training and community facilities. Kia has made reducing the amount of raw materials being fed into the production process something of a crusade in each of its production facilities. The last few years have seen significant progress in reducing waste, increasing recycling and developing cleaner production processes. Modern cars contain explosive materials to trigger their airbags in an accident and large quantities of environmentally hostile solids and liquids which must all be recycled or disposed of safely. Metal components such as the car body, engine and gearbox are relatively easy to recycle, as is the battery pack and exhaust catalyst, but plastics and rubbers present a greater challenge. Now only 5 per cent of a scrapped car is incinerated without energy recovery. Kia has developed an eight-stage dismantling process at its ARR centre to recoup as many materials as possible for re-use while ensuring the few components which cannot be recycled are disposed of with the minimum environmental impact. Once the car to be scrapped has been registered it is taken into an explosives chamber where its airbags are triggered in a spectacular display of pyrotechnics. The car is then pre-treated for scrappage before all fluids are removed. The exterior, interior and powertrain components are systematically removed in sequence and finally the remnants of the car are crushed in a press. These gardens are continually monitored, since they act as real-world indicators of air quality. Each site is broadening the green patches in and around its compound and constantly monitors air pollution in neighbouring communities. A monthly task for each facility is a stream clean-up programme, where Kia cleans and maintains local, natural water courses. This is not only to monitor cleanliness but also to keep them maintained for local communities to enjoy. How do you see the sales share of diesel and PHEV versions of the Sportswagon developing? Diesel will remain dominant even after the introduction of the PHEV, but the issues surrounding the impact of diesel on air quality – even if not fully justified in the case of modern diesel cars – will not go away, so hybrids will become increasingly popular, and they are one of the fastest-growing sectors of the market at the moment. With pressure to reduce fleet CO2, electrification of cars will become increasingly necessary, and we want to be ahead of the game. Most estate cars are bought primarily for space and practicality, yet the battery components for a hybrid powertrain are space-consuming. In the circumstances, is there really justification for a plug-in hybrid Sportswagon? Absolutely, especially when you see how skillfully our engineers and designers have packaged the batteries in the Sportswagon. There has been a slight loss of boot space, that is true, but by placing the batteries behind the rear seats and under the boot floor and reducing the size of the fuel tank – made possible by the car's extensive all-electric range – we have kept this to a minimum. The boot is not only large but neat and level, and by keeping weight down we have been able to provide a 390kg payload, too. The Sportswagon PHEV has lower fuel consumption and emissions and a longer all-electric range than the Optima saloon PHEV, yet it weighs more. How come? The battery storage capacity of the Sportswagon PHEV is greater than that of the saloon – 11.26kWh instead of 9.8kWh. This was deemed necessary for a car whose weight loads and therefore power demands can vary considerably. This increased electrical storage capacity is responsible for the improvements in fuel economy, emissions and range. Will the Optima Sportswagon PHEV be available at every Kia dealership, and will all dealers be able to service it because of the extra safety demands when working with electrical components? As we continue to enlarge our range of electrified vehicles every Kia dealer is required to have at least one technician plus a Kia Master Technician trained in handling the high-voltage systems associated them, so the Sportswagon PHEV will be sold at ­– and can be serviced by – any Kia dealership. What are your sales forecasts for the Sportswagon PHEV, and how do you see the retail/fleet sales division? We are confident of selling 300 units in the rest of this year, and at least 450 in 2018. At least three quarters of them will be fleet sales.